I remember my first triathlon and the slew of things I brought with me into transition area. I think I literally brought everything that anyone suggested I bring. The two things that still stick out to me as stuff I brought that day that I now I see as totally unnecessary were a milk crate to sit on and a little tub that I put water in to rinse my feet off before putting them into my biking shoes. As the races went on I slowly reduced the volume of items I needed to bring with me transition area. This blog will help you remember what to bring with you on race day to make your transition area neat and tidy, which will result in faster times getting in and out of transition. I am definitely a minimalist when it comes to transition area. So keep in mind that these are the bare essentials. Nothing more. Nothing less. Swim – while technically no swim stuff is located in transition since you start with the swim, make sure you always have a couple pairs of goggles. I like to have one for cloudy, low light conditions (yellow or clear lenses, for example) and another that is tinted. Always bring both just in case the weather predictions are incorrect. A swim cap is always provided, so be sure that is packed before you leave the house. Helmet – 100% required for every race. You don’t have one, you don’t race. Simple. Remember to protect your noggin! Sunglasses – I guess this could be optional, but a good pair of sunglasses is nice to have. Keeps the bugs out of your eyes and keeps them from drying out at the blazing fast speeds you’ll throw down on race day! Shoes – If you have cycling/triathlon shoes, but sure to pack those. I don’t recommend wearing socks here since your feet will be wet from the swim and getting socks on to wear there are comfortable will not be easy to do for two reasons. Additionally, your hands will likely be shaking from the excitement/nervous energy of race day making it hard to get those socks on. I like to stack my T1 bike gear in the order I will put it on to conserve space and make it as simple as possible. Sunglasses opened in the helmet. Helmet resting on top of my shoes. Helmet should have the straps opened and the spider all the way open in the back so it slips on nice and easy. Shoes should be fully open, ready to accept those wet feet. Some people prefer to have their bike shoes clipped into their bike and do a “flying mount.” This can be faster if you are proficient sticking the landing and getting your feet in your shoes while riding. It not, putting the shoes on your feet in T1 before mounting the bike is just as fast. T2 – Bike to Run: When setting up run gear in transition area in the morning before the race, I set my running gear on the same side as the bike gear, but just behind it. Race bib – the run is the only portion of the race that you need to wear your race bib. I like to have mine on a race bib that “clicks” together with magnets. Trying to clip it the old fashioned way can be hard to when running out of transition. Running shoes – I like to have racing flats on race day because they are super light and don’t retain water. I would only recommend racing flats if you are a proficient runner. Otherwise, opt for the shoes you’ve done your training in leading up to the race. 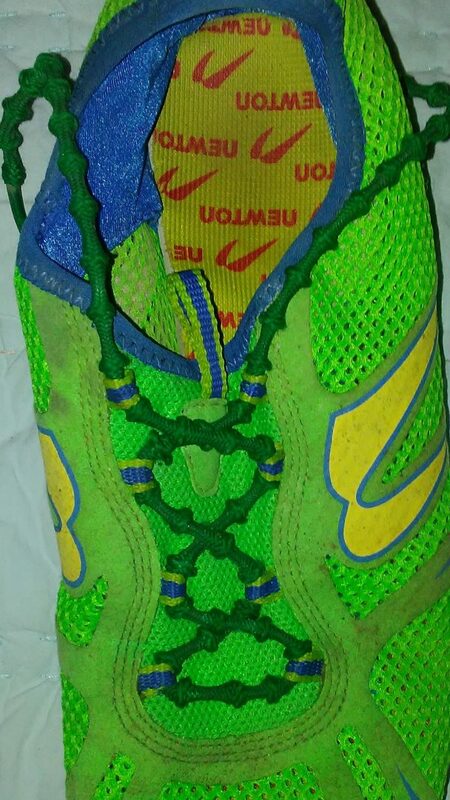 Elastic laces – Having these in your shoes ready to go on race day will definitely save you time. I’m a huge fan of Xentex laces. These are, in my opinion, the best elastic laces on the market. They have little knots in them every inch or so that lock at the eyelets of your shoe to minimize the amount of flex you get when running. This means your foot stays in once spot while you run and you don’t get blisters or hot spots on your feet. In my professional racing days, I would not wear socks for anything 70.3 or less and never got blisters. I could probably have gotten by without them in a 140.6, but didn’t want to risk it. In short, these laces will prevent you from putting on socks in T2, which will add precious seconds to your T2 time since your feet probably won’t be completely dry from being in your biking shoes after swimming. For longer or hotter races, you may consider carrying your own nutrition/water since aid stations will likely be a mile apart on the run. If you are a heavy sweater, staying hydrated with only a few sips of water at each aid station may not be enough. Just as with the bike gear, I place my running gear in the order I want to grab them once I get off the bike. Bib on the ground, shoes on top. If I have any nutrition I want to carry with me that won’t be on the course, I have it in a 6 ounce flask bottle inside one of my shoes that I can easily grab and throw in my back pocket. Nutrition in back pocket (if applicable). Put shoes on, then as I’m leaving, grab my magnetic race bib and leave T2 for the final leg of the race.